Millions of young people go off to college each fall, convinced that it is the only way to enter a career-type field. That is no longer the case, if in fact it ever was. There are plenty of career fields available that do not require college, or at least not a four-year undergraduate degree. One of the unexpected outcomes of the flood of high school graduates into college was the decline of young people entering the trades. This has created an imbalance in which college norm jobs are flooded with applicants, while employers are scrambling to fill positions in the trades. As a result, the income levels of many trades people have increased substantially, to the point where they compete favorably with careers that require college degrees. One such example is elevator installers and repair people. The median income level for the field is $70,910, the future job outlook is solid, and it requires no more than a high school diploma to enter. There are many fields in the trades that pay well and do not require a college education at all, including electricians, plumbers, and aircraft repair. These are just a few of the possibilities, but if you have an orientation toward repair and maintenance, you may want to seriously consider these options before signing on to a college degree program. The notion that you need a four-year degree in order to enter just about any career field is more of an assumption than a reality. There are many stable, well-paying careers that you can enter with just a two-year college degree. Before assuming that you need a full undergraduate degree in order to enter a career field, first investigate the minimum requirements for entry level positions in the field. If you can get in with a two-year degree, you can save a substantial amount of money on the cost of your college education, and consider working toward a bachelor’s degree after you’ve entered the field and are earning a substantial income to help pay for it. The prospects for self-employment are growing particularly with the advent of the Internet. It is now possible to sell products and services globally, and to mobilize resources in almost any category you can imagine. The Internet makes this much less expensive than it once was, not the least of which because you could operate at home from your own computer, without needing to pay rent or hire employees. At the same time, there are many opportunities available providing services for businesses that operate on the web business-to-business. This would include people with social media skills, web building and development skills, and just about any marketing ability possible. There was a story in our local newspaper this week about two 16-year-old boys at a local high school that started a Twitter account tweeting country music lyrics. The pair have identified a serious niche, and their account has grown to over 300,000 followers. As a result of their popularity, they have been approached by advertisers, music promoters and even some big name operators like MTV and some radio stations, with advertising and promotion opportunities. The two are building a serious business before they even graduate high school! This is just one example of what can be done, but the options in self-employment are probably greater than they’ve ever been. The best sales people I have ever known were never educated in sales – it is just an ability that they have, or have developed over the years. While it is true that you may need a college degree in order to enter certain technical sales fields, in many of the more general ones, it’s more about people skills. If you are an extrovert, have strong persuasive skills, and a hunger to make money, a sales career could very well be much more lucrative than any field you can enter in a college norm. A good sales person can easily earn over $100,000 per year. Perhaps just as important, many large companies and departments within those companies are often headed by people who have very successful sales careers. As a successful salesperson, your skills are often more important to a department or company than any technical skills that others may have. Employers put a premium on those who can increase the bottom line – as in increased sales revenue – and few people are in a better position to do that than salespeople. There are plenty of ways that you can get a good paying job without going to college. But it does require that you think outside the box, and consider possibilities that may be a little less conventional than what most young people are looking for. 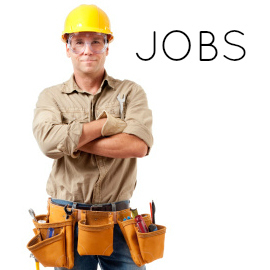 Have you discovered any other good paying jobs that don’t require a college degree? Leave a comment! I am a part time financial coach, but my day job is in healthcare. There are many opportunities to earn a decent income. For example, laboratory technicians (2 year degree) can sometimes make just as much as laboratory technologist ( 4 year degree) be cause they are essentially doing the same job except with a lesser pedigree. Hi Robert – When you do some research it really is amazing how many careers there are in healthcare in particular where you can earn a decent income with just a two year degree.